Alfalfa is a staple in the diets of high-producing dairy cows across the nation due to its ideal contributions of crude protein and physically effective fiber in TMRs. Still, alfalfa remains one of the most difficult and challenging forages to harvest and store properly. Of the alfalfa haylage harvested, the majority is ensiled properly, which results in proper fermentation. However, we still see about 10 percent that goes through clostridic fermentation due to decreased dry matter percentage at harvest. Numerous factors affect silage quality, including moisture, maturity and ash content. As we approach alfalfa harvesting season, it’s important to walk fields to determine how the crop is progressing. Ultimately, harvest timing can be critical to achieving high-quality alfalfa that delivers optimal performance for our livestock. Weather: Unfortunately, weather is something we cannot control. However, weather can have a significant impact on forage quality. Temperature: Forages are typically of higher quality when growing conditions are cooler. Increased temperatures can have several detrimental effects, including decreased stem diameter, accelerated rate of maturity, increased lignification, decreased digestibility, decreased plant height, decreased leaf:stem ratio and increased protein content. Rain: Forecasted rainfall can be a challenge during harvest. Make sure you’re fully prepared for first-cutting alfalfa so you can take advantage of a good weather window and avoid delays. 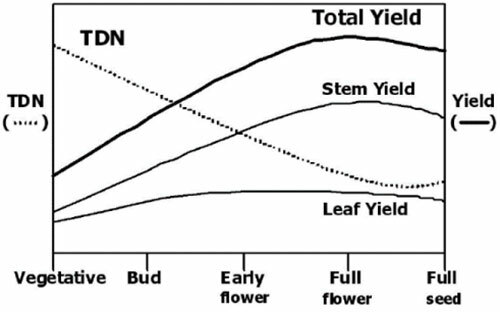 Delaying harvest increases plant maturity, thus decreasing forage quality. Rainfall on cut alfalfa will decrease forage yield and quality through leaching, respiration and leaf loss. Optimal maturity versus yield: Harvesting alfalfa at 28 inches or bud stage (Image 1), whichever comes first, should result in very high-quality forage. If you delay harvest to achieve higher yield, you will sacrifice total quality and total digestible nutrients (Figure 1). Time of day at harvest: It is known that plants accumulate soluble carbohydrates during the daylight; therefore, long sunny days will increase the sugar and starch content of plants. After a sunny day, the sugar content of alfalfa will be the highest in late afternoon and lowest in the morning. Therefore, cutting alfalfa in the afternoon can help to minimize sugar loss prior to harvesting. Cutting during the afternoon will likely increase drying time by nearly 18 hours when compared to morning-cut alfalfa. Depending on the number of acres that you will be harvesting, cutting alfalfa in the afternoon is not always a logistical possibility. Some researchers argue that the increased sugar content is not worth the potential exposure to delayed drying and increased weather risk. Reduce ash content: Higher-than-normal ash levels can be a result of picking up additional ash from soil during mowing, wilting, windrowing and chopping. Raising the cutter height can greatly reduce ash content and further increase dry matter digestibility. It is also important to ensure push tractors and delivery trucks are not contaminating the pile with any soil or manure. Increased ash content significantly increases the risk of additional Clostridia spores in the haylage, further creating the opportunity for undesirable fermentation. Cutting height: For pure alfalfa stands, cutting at 2.5 to 3 inches is advised. To prevent shortened stand life in mixed stands, this should be increased to 3 to 4 inches if the stand includes brome grass, orchard grass or timothy. Drying time: Forage sugar content will decrease due to plant respiration in the field during wilting. Therefore, a rapid wilting process can improve the amount of forage sugar content. One way to decrease drying time is to cut alfalfa in wide swaths, thus increasing the surface area exposed to the sun. If the alfalfa is going to be ensiled, the additional sugar will aid in a more desirable fermentation process. Length of cut: There is a lot of variability with haylage due to the type and use of machinery, sward type and density, and — most of all — the dry matter of the crop harvested. Using the Penn State Particle Separator, we can more easily evaluate particle length. Ten to 20 percent of the crop should be in the upper sieve of the particle separator. Particle size recommendations may need to be altered based on silo type. Forages stored in upright, sealed silos would likely fall at the lower end of the range (10 percent). Bunker silos can handle appreciable longer material (up to 20 percent on the upper sieve). The middle sieve should contain 45 to 75 percent of the material, and the lower sieve should hold 20 to 30 percent. No more than 5 percent of material should be retained on the bottom pan. Minimize leaf loss: Rake or merge wide rows at a higher level of moisture to retain a higher leaf percentage on the leaf:stem ratio. Research has shown that disturbing drier windrows greatly reduces the leaf percentage of the post-harvest product, thus decreasing quality and yield. Use a researched inoculant or preservative: The use of a high-quality inoculant will reduce silage pH, conserve sugars, reduce heating, reduce dry matter loss (shrink) and improve consistency and palatability of ensiled feeds. Hubbard Feeds offers both inoculant (Sil-All®) and preservative (Bulletproof®) options to meet your forage needs. Packing density: Packing density should exceed 15 pounds of dry matter per cubic foot for forages in order to provide the anaerobic environment that will help improve both fermentation and feed out stability. A good rule of thumb for the required pack tractor capacity is to multiply the tons of silage being delivered to the bunker per hour by 800. For example, if the haylage is being delivered to the bunker at 100 tons per hour, a total of 80,000 tons worth of pack tractor is needed (or approximately two large packing tractors, not counting the push tractor). Cover bunkers/piles: Cover bunkers and piles with a layer of oxygen-barrier film and then add overlapping plastic that lines the interior walls also. Consider the use of a surface inoculant with or without an oxygen barrier film. Emphasizing the aforementioned critical control points can greatly enhance yield, fermentation and preservation of higher-quality alfalfa haylage throughout the 2018 alfalfa harvest season. Important safety message: Varying weather patterns can cause narrow windows of alfalfa harvest opportunity. This greatly increasing the likelihood of stress, fatigue and a general disregard for your surroundings. Remember to keep yourself and team members rested and hydrated to ensure clear thinking and decision-making is taking place.